A pioneer of New German Cinema, Werner Herzog has enjoyed creative peaks and overcome commercial troughs to settle on a duel artistic life, operating a ‘one for them, one for me’ strategy that allows him to parlay his work on commercial fare like ‘Rescue Dawn’ (2006) and ‘Bad Lieutenant’ (2009) into a slew of personal projects delving into the deepest, darkest recesses of human compulsion. A common thread in Herzog’s work is the exploration of existential, geographical and physical extremes. From ‘Aguirre, Wrath of God’ (1972) to ‘Grizzly Man’ (2005), Herzog presents characters driven by inexplicable desires and consumed by implacable urges that place them outside the bounds of conventional behaviour, ignoring the portents to forge ahead to their doom, swathing their folly in divine purpose. His reputation in Hollywood’s portals of power as a feral merchant of ‘chaos, hostility and murder’ has been rehabilitated in the last few years by a series of remarkable films that guided the syntax of cinema into new and strange directions. Billed as a ‘science fiction fantasy’, ‘The Wild Blue Yonder’ is a difficult film to place within any accepted parameters, taking a fanciful subject and presenting it with such unerring immediacy and plausibility that it feels like a Von Daniken novel adapted by Errol Morris. Carried with admirable gusto by Brad Dourif’s central performance, Herzog delivers a requiem for a dying planet that is at turns playful and earnest. Dourif is an unnamed alien, an intergalactic refugee from the ‘Wild Blue Yonder’ of Andromeda whose forebears settled on Earth in an attempt to lead the indigenous population in the right direction, occupying roles of influence in government and intelligence agencies. With the Earth now barely habitable, humanity seeks to escape the planet and colonize Andromeda. The Alien must watch in despair from Earth’s desolate husk as his home world is ‘adapted’ to humanity’s rapacious demands, delivering an impassioned monologue on the background to such a development. ‘The Wild Blue Yonder’ is a remarkable example of taking footage without any apparent connection and from it assembling a narrative arc, expounding grand theories from the sparsest of starting points and utilizing a charismatic actor to unify the disparate elements. The film casually throws out ideas that could provide material for a number of films – from re-examining the Roswell Incident to positing that breeding pigs marked the beginning of the end for humanity. Dourif delivers a tour de force as the forlorn ET, narrating the ten chapters into which the film is divided with a barely concealed anger and bitterness, railing against our hubris and lamenting the neglect of our most valuable resource. Herzog slyly plays with the nature of truth, presenting us with a number of phoney experts who present their ideas with a veneer of authenticity and conviction that would lead some to believe they were credible sources if viewed outside the context of the film. ‘The Wild Blue Yonder’ is quite unlike anything that has preceded it. A particular highlight is Henry Kaiser’s footage from the base of the ocean, which is used to replicate the conditions of Andromeda. Kaiser captures the manifold life forms that reside there with stunning clarity, detailing an environment so eerie and otherworldly that it outstrips anything the human mind could create, a world where beauty and brutality have learned to co-exist. Herzog’s intentions are as unclear as ever; but whether consciously or otherwise, ‘The Wild Blue Yonder’ presents an argument for environmental responsibility more persuasive than all the PowerPoint presentations in the world. Inspired by Henry Kaiser’s underwater footage in ‘The Wild Blue Yonder’, Herzog set off to Antarctica at the height of the Austral Summer; keen to understand the sort of person who would live in a place with five months of permanent daylight and determined not to make a mawkish anthropomorphic film about penguins. Herzog travels to the McMurdo research centre, where his romantic notions of Scott and Shackleton are shattered by the base’s prosaic environs, with its modern amenities and resemblance to a construction site. Stifled by the cosy modernity of McMurdo, Herzog sets off into the heart of the planet’s most inhospitable terrain, providing narration in his breathy, mellifluous timbre. Along the way Herzog encounters all manner of striking scenes that repudiate the Disneyfication of nature and highlight the creeping homogeneity that is eroding our planet’s diversity – the Teutonic fatalist in Herzog comes to the fore as he details the cruel realities of a landscape that is brimming with life above and beneath the surface. The ultimate rebuke to those who seek to dull nature’s sharp edges and manipulate it for their own ideological purposes is the sight of a penguin breaking from its group, heading towards the mountains and certain death without any apparent motive. ‘Everyone who’s not tied down falls to the bottom of the planet,’ says William Jirsa, a linguist at McMurdo. Herzog meets a succession of ‘professional dreamers’, restless, obsessive souls who must keep moving, searching for something in the stillness and silence they failed to find elsewhere. There is the driver who was accused of kidnapping a child in Guatemala, the plumber whose fingers signify he belongs to the Mayan royal bloodline, the Iron Curtain refugee who is always packed to leave at a moment’s notice and the woman who travelled to Peru in a sewage pipe. That such stories are commonplace tells us much about those who are drawn to Antarctica. Herzog laments the dilution of our adventurous spirit, how our innate curiosity and desire for personal glory has transmuted into fatuous pranks and ludicrous record attempts, using footage of Shackleton performing an unconvincing recreation of his quest on a soundstage to illustrate this adulteration. ‘Encounters at the End of the World’ is a celebration of those hardy souls who remain on the fringes, enduring the hardship out of a desire to mitigate human damage and gain a deeper understanding of their surroundings. 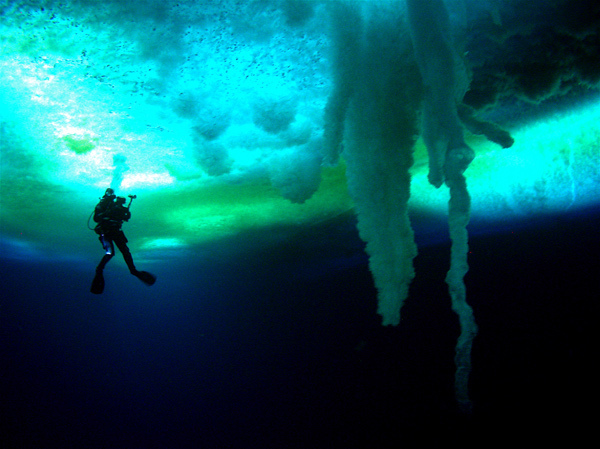 ‘It’s a horribly violent world,’ says Sam Bowser, a biologist studying life beneath the ice. We are treated to the full majesty and menace of the primordial environment that the Tetrapods clambered to the surface to escape. Equally primal is Mount Aribus, whose lava lake sends jets of magma shooting above the crater rim. A dedicated team studies the volcano, risking their health and sanity in an attempt to understand her awesome power and potential impact on humanity. What is abundantly clear in ‘Encounters at the End of the World’ is just how precarious our existence is, that if we wish to escape the fate of the dinosaurs or humanity in ‘The Wild Blue Yonder’, we must respect nature and fear its capacity to inflict catastrophic damage. Herzog’s ambivalence is unmistakable; he shrinks from the sunlight but marvels at the callous configuration of it all, but even this most lugubrious of voices sees that it isn’t all chaos, hostility and murder.